Marsha and Kelly catch you up on all the things that have been going on with them over that last month. New projects, new goals, new items in the Ravelry queue, new excuses pets family members, and new realizations about time management! 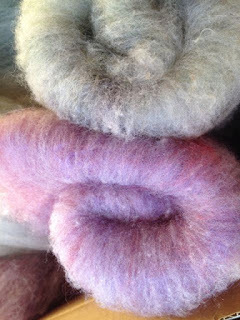 Press play and listen as we talk about our fiber adventures! 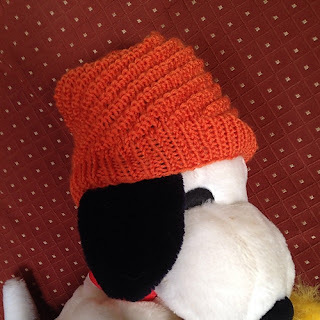 Then join us in the Two Ewes Ravelry Group! Kelly has one newly finished project, Toddler hats that she made for Robert's co-worker's daughter. 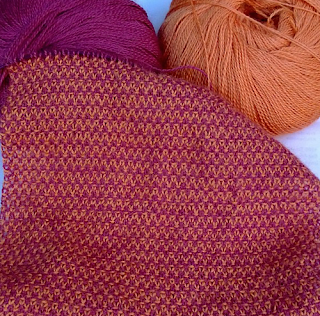 One is plain stockinette with some embroidered flowers and the other has a texture pattern. 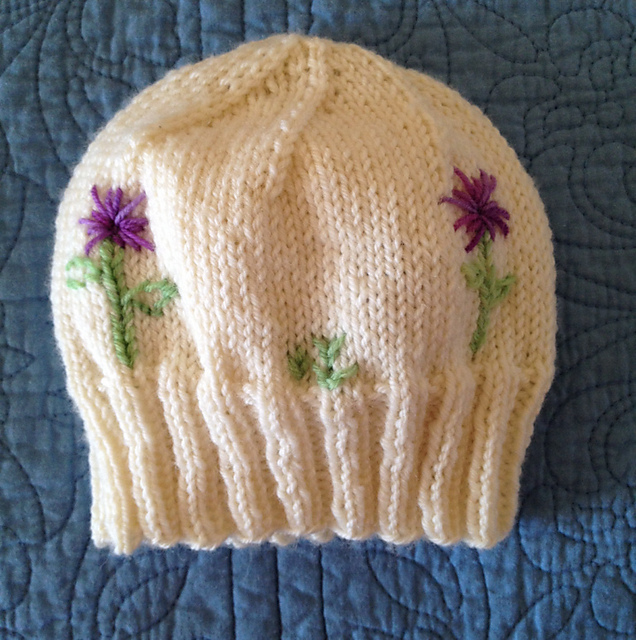 Neither was made using a pattern, but information about them is on Kelly's Ravelry page. She also has a newly started project. 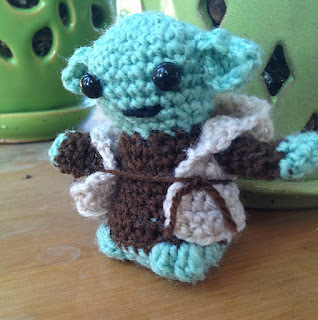 She made Yoda from the Star Wars Crochet kit. The designer is Lucy Collin and between her blog and the Flickr account she has with all the different Star Wars figures (some not in the kit) there are enough ideas for an entire galaxy of figures! Speaking of Big Sur, Kelly met her two-week goals with respect to walking. She repeated the same goal for the next two weeks and will check in again. The training for the Big Sur 21 Miler is going well. The other two-week goal, finishing three skeins of the yarn for her mom, was not so successful. She has finished one skein. The Two Ewes blog can now be found using the urls http://twoewesfiber.com or http://twoewesfiberadventures.com Also, you can now find Two Ewes Fiber Adventures on facebook. The new episodes will be published there in addition to this blog, iTunes, and Stitcher. Marsha and Kelly discuss spinning the batts of California variegated mutant (CVM) that Kelly has made and is sharing with listeners. The breed is often available at the Monterey County wool auction, but is classified as critical by the Livestock Conservancy. The wool and mohair blend is spinning up easily, but does have some vegetable matter. It makes a nice, lofty, woolen-spun yarn, but has some sheen due to the mohair. 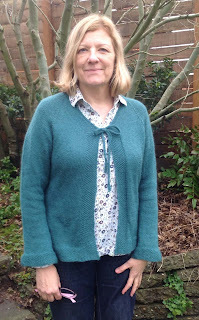 Marsha finished her Mystery Wool Cardigan made from coned wool she found at the Goodwill. The pattern is #241 Neck Down V-Neck Shaped Cardigan by Diane Soucy from Knitting Pure & Simple. She loves the fit! 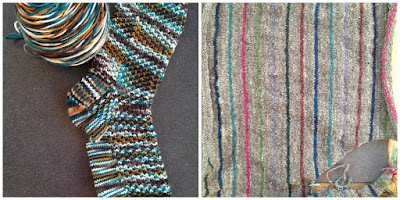 Marsha talks about the process of washing the finished cardigan. She continues to work on her Striped Study Shawl by Veera Valimaki. She is worried she won't have enough yarn to finish the pumpkin stripes. Marsha's BIG news is she got a standard poodle puppy named Sovereign's Formula One or "Enzo". 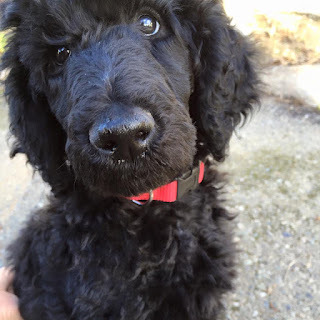 He was born December 5, 2015 and joined our family January 29, 2016. 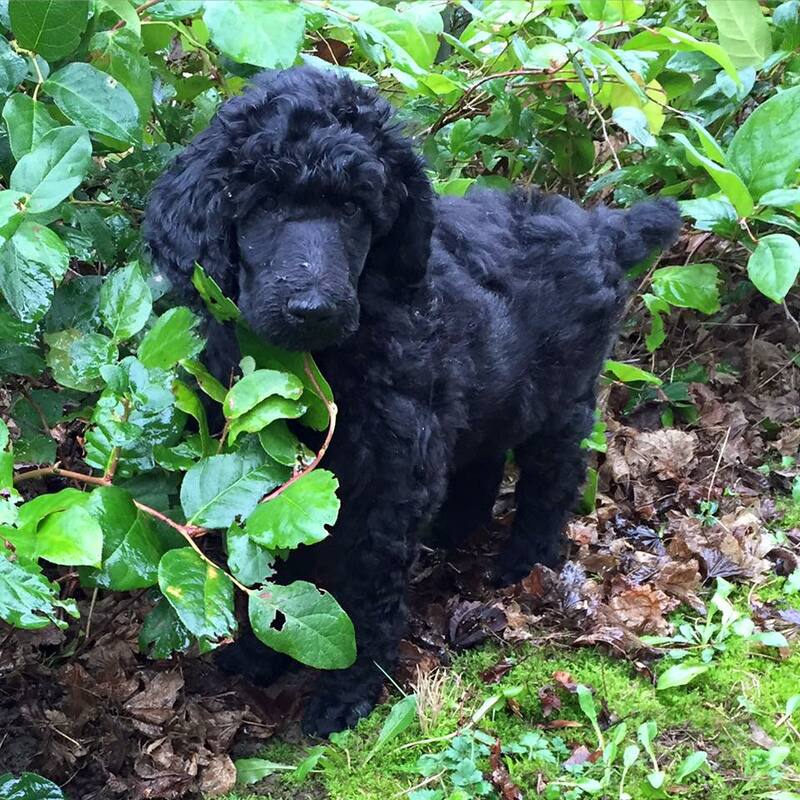 Marsha is looking forward to long walks with Enzo. 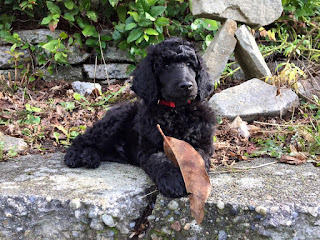 A new puppy is a huge undertaking so Marsha has not met her goal of walking three times a week. Kelly recommended the dog training book by the Monks of New Skete. A terrific book! 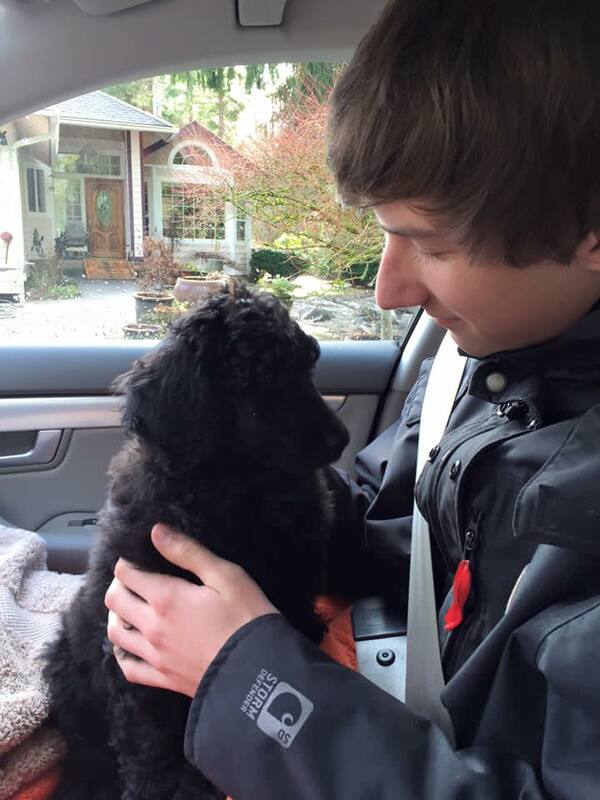 Ben and Enzo on the way home. Marsha talks about sharing a celebratory bottle of champagne with her friend Kim. 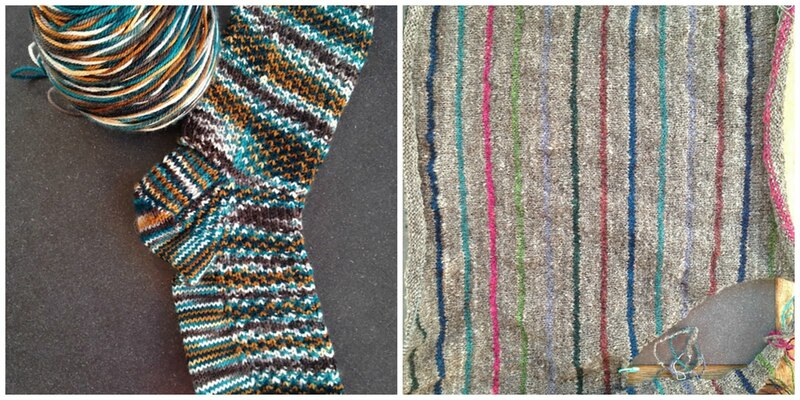 Kim just finished the scarf called Two-Tone Twill Scarf by Churchmouse Yarns and Teas. It took her a year to complete so she definitely deserved champagne to celebrate. 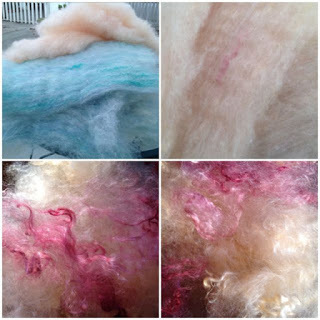 The Two Ewes are excited to offer CVM and mohair blend batts, as well as the handspun mini-skeins made from them, as premiums for any listeners who would like to support the podcast! Any contribution of $15 or more will qualify for the premiums. Kelly will contact you to determine whether to send fiber (two approximately 1-ounce batts) or mini-skeins (two approximately 80-yard minis). If you are interested, please click the donate button!